Ruby black color. Oaky aromas of raspberry scone, raisins, varnished oak, spiced caramel, licorice, and blackberry mostarda with a slightly chewy, crisp, dryish medium-full body and a tingling, interesting, medium-long dark chocolate coated nuts and earth finish with firm tannins and heavy oak flavor. Get lost in the wild fruit notes that balance this dry and ageable Bordeaux. Bottom Line: Get lost in the wild fruit notes that balance this dry and ageable Bordeaux. Pomerol and St. Emilion are the two premier Bordeaux appellations on the other (right) side of the rivers from the city of Bordeaux and the glamour appellations of the Medoc; hence the term, "Right Bank." The wines are quite different from those in the Medoc; the weather and soil vary significantly, and the primary grapes used in the region are the softer merlot and cabernet franc varieties, as opposed to the firm and tannic cabernet sauvignon of the Medoc. This makes for wines that are often much more attractive in youth; however, this doesn't mean these wines lack the ability to age. St. Emilion is a much larger appellation than the Medoc with a significant percentage of cabernet franc helping to comprise the blend. This too makes for softer, though still well structured wines, with distinctive cedary, herbaceous, mineral-accented flavors. Increased production quantities make them easier to find, and a number of bargains are to be had for the savvy consumer. A final note: Vintage assessments in Bordeaux tend to be weighted to the Medoc, as opposed to the right bank. A given vintage will be declared excellent or poor with the supposition that this is universally true, which is not always the case. The vintages of 1996 and 1997 are a case in point. While 1996 saw excellent wines produced in the Medoc, it was not nearly as successful on the right bank. Conversely, while a number of Medoc 1997s were disastrous, the wines of the right bank look to be excellent. 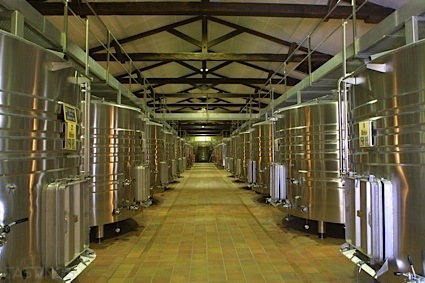 Thus, while certain vintages may have been overlooked due to a bias against wines from the Medoc, the right-bank versions may have been unjustly lumped into the same pot. 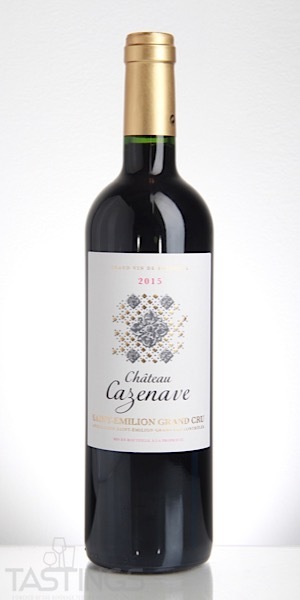 Château Cazenave 2015 Saint-Emilion Grand Cru rating was calculated by tastings.com to be 90 points out of 100 on 12/6/2018. Please note that MSRP may have changed since the date of our review.